There are many artists that have given us great depictions of The Thing. John Byrne, Scott Kolins, Andre Divito, George Perez and of course Jack Kirby are among my favorites - but when I close my eyes and think of the character, the image that pops up is always a Ron Wilson illustrated Thing. I loved Marvel Two-In-One growing up and for me, Wilson's was always the definitive version of the ever-lovin' idol of millions. Ross, you've done many, many covers with the Thing, but what I'd really like to see is an All Things Considered cover with the Thing (Ben Grimm), the Thing (Charles Addams/the Adamms Family) and Thing One and Thing Two (Dr. Suess's the Cat in the Hat)! Great cover, Ross. This cover got me thinking how well Starman and Ben's best friend Reed Richards would get along which in turn got me thinking about an all scientist-superhero cover featuring Mr. Fantastic, Starman, Dr. Solar, Dr. Benton Quest, etc. If you ran the cover on a Friday you could even call it "Science Friday" in keeping with the earlier NPR-inspired suggestion of "All Things Considered". Yes, Total agreement! He had the voice down! 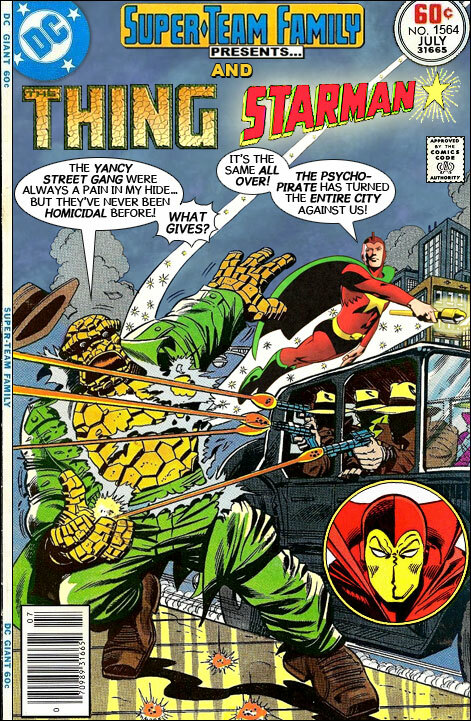 MARVEL-TWO-IN-ONE was almost always a better read than MARVEL TEAM-UP because they usually put more emphasis on the guest star. MARVEL TEAM-UP was much more focused on SPIDER-MAN with the second character often treated as an afterthought. Whoops. I should have checked! Could you add Thing One and Thing Two to the index? I loved your cover with the Thing and the Thing, with Thing One and Thing Two, but adding in "Thing" Addams would be just the thing, all Things considered. While scrolling down to remind myself of that cover, though, I caught a glimpse of Green Lantern Alan Scott, and thought, "He really needs to pay a visit to Edna Mode." What do you think? Because he has a cape? Ragman and Spider-Man in "Patch Work"